Tesla Inc. is an electric-car maker headquartered in Palo Alto, California. The company was founded in 2003 and went public in July 2010. Ever since, Tesla has been on top of the trend towards alternative powertrains in the passenger vehicle industry. 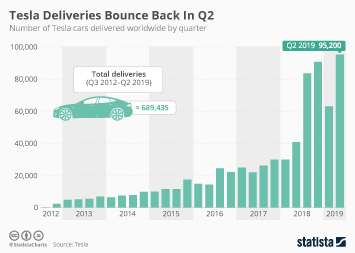 Globally, Tesla delivered around 90,700 vehicles during the fourth quarter of 2018, after fiscal year 2017 deliveries amounted to around 103,000 units. As of 2018, Tesla's model range includes the Tesla Model S, Tesla Model X, Tesla Model 3, as well as future planned Tesla Semi and Roadster models. The company’s products were originally aimed at customers in the high-end sphere of the market, but with the release of the Model 3, are now targeting broader customer segments. The company conducts business in North America, Asia, and Europe. While the domestic market continues to be its most important target market, Tesla was able to successfully tap into the Chinese and European markets, as well: The Netherlands contributed some 966 million U.S. dollars to Tesla's revenue in 2018. In terms of range, Tesla’s Model S remained the cream of the crop in 2018, and it is little surprising that the Model S was the best-selling all-electric car in the United States in 2017. Tesla also has its own energy generation and storage segment. In July 2014, Tesla and Panasonic announced to participate in the construction and operation of the world's largest battery factory in the United States. Furthermore, the company is heavily involved in the development of driverless cars. However, Tesla’s autopilot technology has come under scrutiny after a failure caused fatal accidents in 2016 and 2019. Tesla Model S is the best-selling all-electric car in the U.S.